My favourite lullaby is one I discovered just into my teens and included it in a surprise Mother’s day performance I was organising with other kids at the Embassy. It’s about little Balázs, Lullaby (Altató in Hungarian) by Attila József. (The only complication for performing this was I had a HUGE crush on a Balázs at the time, so I was beetroot red throughout …funny memories!). It’s a very gentle poem, that takes you into the land of dreams. I used to recite it to Angelina as a baby trying to remember the lines. I turn to Attila József Lullaby whenever the littlins are hyper and I know calming them will be a struggle… this poem magically soothes them, it whisks them off into the land of calm, the land of imagination and towards sweet dreams where they can achieve anything. That is the power of a lullaby- be that song or poem. They are part of our daily routine, just as a bedtime story or two are. Let me share this favourite of mine with you (including the translation I’ve done). You’ll be a firefighter and a soldier! A shepherd herding wild beasts! Recently I’ve found a version of it sung by children’s pop singer from my childhood- Judit Halász. What do you sing or read to soothe your little ones to sleep? Do you have a favourite? Bedtime is fun and relaxing, it’s the calm at the end of the day. When you put your little one down to sleep and sing them their lullaby you NEVER expect it to be their last and for them never to wake up again. Unfortunately, each year for about 300 or so parents in the UK alone this nightmare turns to reality, like it did for fellow blogger Jennie and her family on the 2nd of February 2013. 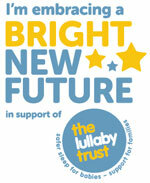 The Lullaby trust, formerly FSID, is there for the families to support them through their tragic loss and darkest hours, as well as promote safer sleeping for babies. My post is dedicated to Matilda Mae and all the babies who fell asleep and never woke up. Sleep tight little angels and blow some kisses and happiness to your families and friends missing you! Thank you! I do love it. Talking about lullabies and poems .. and songs, one of my favorites is: “over the rainbow” by Judy Garland in the “Wizard of Oz”. I could be listening to it for hours and never get tired.. 🙂 Not only all these bedtime stories and lullabies are so riveting and “magical” but very often bring a message of wisdom. They also bring out the child which is still alive in us. Oh that lullaby has so many lovely images! I wonder why there aren’t many lullabies in Hungary? I’m not sure. There are probably ones regionally, but strict, no nonsense principles were still the norm in my childhood… Maybe that’s why? Could you tell me the name of the board book? I am looking to get one for a friend and as I’m not Hungarian myself I have no idea where to begin! Jennifer, the book is called Altató. I can highly recommend it, it’s a lovely little book.